None of us staying at the Strathcarron Hotel on the eve of the Challenge could have failed not to notice the constant stream of motorbikes that roared past the hotel. Back at Loch Carron we spent another two days with the bikers. Our hotel sported a flag come surfboard sail proclaiming the NC500. All were welcome. The hotel even had sings up as you entered the visit which proudly announced that they were selling NC500 T Shirts. So, what on earth is the NC500? The National Coast 500 is described on its website as “the ultimate road trip,” a “… new scenic route showcasing fairy-tale castles, white sand beaches and historical ruins”. The NC500 is a circular route of over 800 kilometres which (if) starting in Inverness, heads out to Loch Carron and then turns north, hugging the coast road past Torridon, Ullapool, Thurso, John O’Groats, work and back down to Inverness. Officially, the route aims at cyclists as well as motorists but the sponsorship of the route by Aston Martin tells you all you probably need to know. 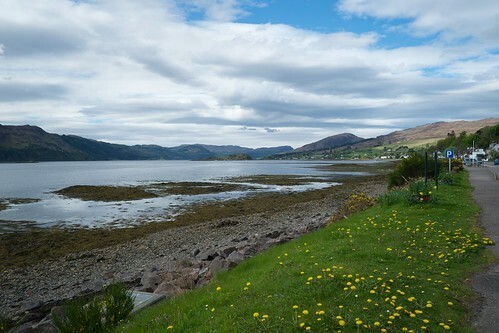 Once ensconced in Loch Carron there wasn’t much for me to do except hobble down the loch side road. This is a delightful little village, especially in the glorious weather we experienced. There’s small general store here which has been voted best small store in the Highlands. There’s a cafe which had been voted best cafe in the Highlands. And they were both excellent. While Challengers were striding out over hills, fording rivers and taking in summits and high passes I was moving from the bar of the Loch Caron Hotel (which features a stunning panoramic view) to the cafe and back. There was plenty of time to muse on the NC500. Yes there were many motorbikes but there was also a near constant stream of what we used to call sports cars. There were classic cars — Triumph Stags, MGs, soft top Mercedes and Volvos as well as more modern sporty things from TVR and Jaguar. It was not uncommon to see line of five or six cars — tops down — driven by a bridge of drivers in their seventies. Huge motorbikes would rock up at the hotel. Bikers would dismount and then set about getting out of their spaceship leathers. Young bikers? No way! Yet more folks in the 60s and 70s — probably the only people who can afford these machines. And then there was a constant stream of caravans and rented motorhomes. I was moved to google motorhome hire in Inverness and was astonished at the number of rental businesses based there. A fair proportion of these mist have been heading out on the NC500. The route was a projector the Scottish Government and it seems to have been very successful. There are Facebook pages and websites devoted to it, in just the same way as Challengers write their trip diaries. I found it quite bemusing really as my knowledge of the Highlands is almost totally derived from self powered trips. There’s no doubt the route has given a boost to the local economy; we were told that most of the hotels and B&B’s along the route had increased their prices on the back of it. But there is always a downside with these motor projects. Some locals complained that the roads were now too busy and that the rod infrastructure couldn’t really cope with the traffic. It was easy to see that this was the case. I wondered about the roads up north which are often little more than large singe carriageways driven across empty and boggy country. Bob Cartwright tells me that he has looked at the Facebook sites. Apparently, there are lots of pictures of performance vehicles ditched off road in boggy ground! Back in Loch Carron it seems somehow wrong to have to wait ten minutes to be able to cross the road through the village (albeit I wasn’t moving very quickly). I couldn’t help wondering what kind of trickle down there was from this tourist pend to the local population. Most of the businesses in Loch Carron seemed to be owned from people who had come north from England — nothin unusual there. Our hotel — while it had much to commend it — was a family run affair, a family from London and Kent. Of course, there would be local labour involved but I wonder how much. After one evening we moved to a B&B on the side of the Loch — The Old Manse (a superb place). 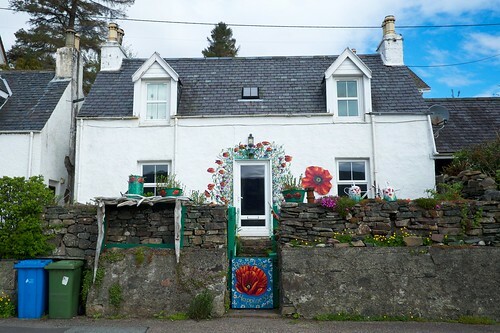 This B&B is situated a little out of town with wonderful views of the loch but even here it seems that quite a few of the visitors were tackling the NC500. I got chatting to one couple who had completed the whole route (and were just nipping back to the village as they liked it so much). They had taken a few extra excursions including Shetland. In all that time they recommended they had only stayed at one Scottish owned and run business! So this has been a success but in a strangely limited way and there is an environmental cost. In the short term villages and remote hotels will benefit but I wonder how long it will be before there are real calls to curb the traffic? 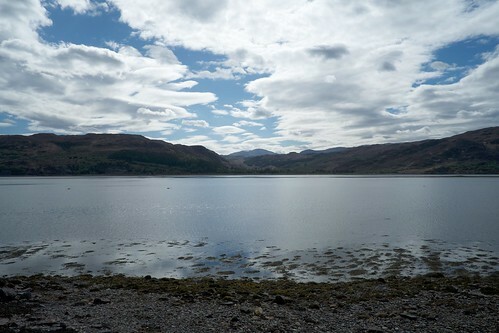 However, I don’t want to put you off visiting Loch Carron should you ever had cause to. It is a lovely place with some really nice businesses. Al built around the stunning view over the loch. Like many such places, for example in Devon or Pembrokeshire, the place is clearly changing, getting a bit more alternative-y as old hippies move in — nothing wrong with that of course as it just adds to the atmosphere. 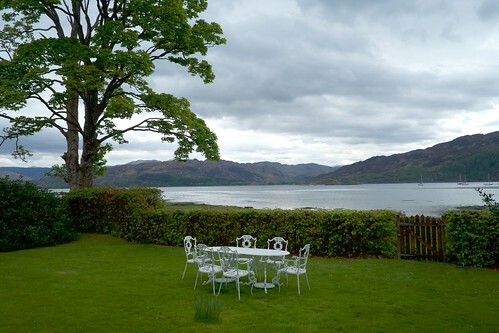 Loch Carron was an ideal place to start licking wounds and — as Kate put it — felt like what real holidays are supposed to feel like. The hotel was really our base. And for those of you challengers who started with us in Strathcarron we met the Chef who had walked out — he’s now back at the Loch Carron. And very nice food it was as well.